It's been over a year since my last posting. As I get ready to start the fall semester, there is a glimmer of hope that I can start blogging, regularly, again. It's been about 9 months since I've had a sliver of free-time, so with that sliver that I see coming, perhaps the blog can be resuscitated .... Of course, only time will really tell. The greatest gift we could give each other on Valentine's Day was time together - a nice lunch out and general bumming around town. Love the kids to death, but time with my wife is wonderful, and it doesn't happen as much as I'd like. But that's life these days, and life is good. Real good. Everyone here is sick - blah. That's one of the fun things about kids -- once one gets sick, you ALL get sick. And so it is here. It's not horrible, but it's not fun. We're all feeling pretty tired, congested, and the kids are irritable -- short naps are not a good thing. Because we have just one humidifier (really, does anyone have two? ), we put the kids in the same bedroom tonight so they could share it. This is a first, and it could be an interesting night. So far, we're two hours in and no major problems. When I was younger, I was always struck by how my mom gave blood regularly. I don't know how or why she started to do this, but I recall her doing this often. Recently, I noticed in the local paper a need for blood donation, and it hit me that I have no real reason for not donating blood. Really, it was just laziness and apathy. So I started a new trend today and stopped into my local blood donation center and gave. It was simple. Aside from filling out a small form and waiting a few moments for a nurse, the actual giving of blood took a bit more than five minutes -- ten tops. Later in the afternoon I felt a bit tired, but nothing worse than that. We decided to branch out and add a 2nd cell-phone line to our plan, so I stopped in the local cell-phone store and inquired about doing so. I learned we could do that, get a free phone, and we were due a free phone upgrade (it had been 55 months since we got our original phone). Now, we're not the most cell-phone dependent people, but, a free new phone is a free new phone. The clerk informed me that he had never seen anyone go so long without upgrading .... good to know. 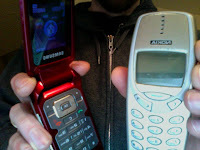 That's our old phone on the right and the sleek new one on the left. Wowee! Why it continually happens with this blog, I'll never know. The peaks and valleys of writing here cause me to think about ending the writing, but I always come back ... eventually. And, I am writing here again. It's cold today, just hovering above zero, and I spent much of my day driving, back and forth up to Bloomington. The snow blew across the road, causing the road to disappear at times, but it was never much worse than thick fog, until I got up to Bloomington - the roads were far worse there. But the new tires I got for the car really made me feel more comfortable in the bad conditions. And, I made it back home, so all is well. But that's the problem with taking classes up at ISU -- the spring semester. The weather is never bad in the fall, but in the spring, there are always a few nights when the roads get ugly, or the weather just makes me nervous, continually, about driving up and down I-55. This me thinking about when I was younger, 18 or so, and my friend Mike Alfini and I drove into Chicago to go record shopping, at stores like The Dummyroom, and Reckless Records, in terrible weather. There must have been at least three inches of snow on the roads, but we went anyways -- invincible. I can see the icy water puddles that gathered at the curbs, and the piles of snow that piled up in the curbs. But I have no clue what records I bought. None at all, and I am 99% sure I don't even own them any longer. But we made it downtown and back, safely, just as I did today. Come on .... enough is enough. Give Ron Santo what he deserves -- to be a Hall of Famer. I heard this same story three times today, and not once did anyone explain it well. It's no secret that college tuition can be expensive and that tuition at some schools costs much more than it does at others. It is also no secret that some schools increase their tuition yearly. But when ABC news reports on just how expensive tuition is getting and how it is putting a college education out of reach for some folks, it irritates me ... not that they're wrong, but that they are implying that colleges are increasing tuition without much care for who it hurts. The fact is that increasing tuition is often a college's last option to allow it to continue to function at its normal level (number of classes offered, variety of classes offered, high-quality faculty, safe facilities, ...). College administrators are not dumb; if tuition becomes too high, they lose students, which means that they will get less assistance from the state. And THAT is the problem: states continue to cut the budget for higher education institutions. And, those same colleges are working hard to continue to offer the same education to its students when the resources of that college are shrinking. In order to continue to do what they do, they need to supplement the money that the state is no longer offering them with money from somewhere -- which is often tuition. But, again, this is a last resort, and one that is not taken lightly. Since I have taught at the college-level, I have never heard of a surplus of money coming in from the state. For the last seven years, each school I have taught at has talked about hard times and budget cuts. But more and more students show up, so we are doing more with less. So when tuition is increased, it's not about making a profit (there might be some exceptions to this, but not in the community college realm, at all); it's in an attempt to keep the lights on and help students get what they need. We coulda been a statistic -- seriously. You hear about all of these people who are running into trouble affording their monthly mortgage payment, and as I listen, I can't help but thinking about how lucky we are that we got out of our trap when we did. In our previous house, which was our first, we were in a trap-mortgage, which I believe was a 7-year ARM (adjustable rate mortgage). That means that after seven years, the mortgage company would adjust (raise) our interest rate. And, to make matters worse, we had a home equity loan to make up the difference of what we had been short for our 20% down-payment. That, we learned over the months, was not a fixed rate, either. Our payment on that was higher each month, which was tons of fun. Fortunately for us, we sold our home when the market was high, and we made money to have a solid down-payment on our current home, and our mortgage is fixed -- for the next 25+ years. But when I think back to our previous situation, I get sick. We always knew we would refinance, but never thought that the market might be so bad that refinancing wouldn't really be possible. I feel for those who weren't/aren't so fortunate. Going Google-crazy with Gmail Video Chat! If you haven't heard, Google now offers a video-chat feature via Gmail. And, it works really well. Really. Well. I am a big fan of iChat, but have had connection difficulties at times when talking with my wife while I am at work and she's at home, and we often resort to calling each other to finish a conversation. But over the past two days, using Google's video chat, we've had no problems. Earlier today, I even connected with my brother in Indianapolis, and I got a short tour of his spare bedroom/computer space. Very cool. If you have a webcam and a Gmail account, check this out at Gmail Voice and Video Chat. I haven't written anything at all about my fantasy football team this year, but after 10 weeks, my team is 10-0. Yes. I am undefeated. Every week, I have been okay with the prospect of losing, but it hasn't happened. 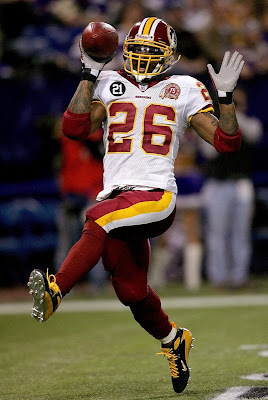 This week, things have gotten to be a bit more challenging; my top player, Clinton Portis, is out, most likely, with an injury ... and I play the 2nd place team. But I have balance, and depth on my side, so I am pretty confident. Only time will tell. This year, for Halloween, we carved our first pumpkin. N drew the face, and I cut it out. She got a little upset when she saw me cutting out the eyes, mouth, and nose that she so carefully drew, but once I put a candle inside and lit it, she got the idea ... and was very impressed with our handy work. With the election of Barack Obama to the Presidency, I have been thinking about exactly what to write and how to commemorate such a historic event. One of my best friends, Eric, sent me this piece that he wrote following his experience of attending Barack's celebratory gathering in Chicago's Grant Park. I have known Eric for over ten years now, and have read much of his writing, but this piece truly captured what I believe being there must have been like. Thanks, Eric, for the guest blogging! On the corner of Madison and Michigan Avenues in downtown Chicago hangs a small brown sign designating historic Route 66. Depending on whether you are travelling east or west, that point is either the beginning or end of a journey. Twenty-four hours earlier, I received an electronic ticket for the Democratic party’s Election Night Event in Grant Park – the hottest ticket in town, and perhaps the country, reserved for only 75,000 people. Friends, family, city workers, and police officers all warned us to stay away. The City of Chicago had put together its largest riot response plan ever, not wanting to repeat the missteps of the 1968 Democratic National Convention in the same location. Standing in line to vote on Election Day, my fiancée Jessica and I debated how the city and the nation would react to the results. We also decided that regardless of the potential for trouble, we wouldn’t miss what we felt was a once in a lifetime chance to be part of history. After all, we lived less than a mile from the rally site and had watched the preparations for weeks. By that point, our hour long wait to vote was over and we cast our ballots with high hopes for the outcome. The gates to the rally were set to open at 8:30 p.m. so there was no rush to be first in line. But under the pressure of rapidly growing crowds, city officials began letting supporters in around seven. At the same time, east coast results were flooding the newsrooms and it appeared that Illinois’ junior senator was moving full speed ahead toward a win. We grabbed our coats and headed into the night. With most streets closed to traffic, our neighborhood was eerily quiet For the first four blocks of our walk, we were totally alone. But as we neared Grant Park, we began to hear the roar of the crowd. Michigan Avenue’s triple-wide sidewalks were jammed with supporters, shoulder to shoulder, in front of a backdrop of the city’s iconic skyscrapers draped in red, white, and blue light. The crowd easily surpassed those gathered to gawk at the marathoners a few weeks earlier, with the electric mood resembling a New Year’s Eve in Times Square. A shortcut through the south end of Grant Park landed us at the event entrance. Under different circumstances, a crowd that dense may have spelled disaster, but not this night. Pressed up against one another like books on a shelf, the crown calmly moved toward the entrance, taking an occasional opportunity to cheer on continuing election results reported from cell phones and Blackberry’s. Four security checks and 30 minutes later we entered Hutchinson Field, the center of worldwide political attention, if only for one evening. With the crowd pouring onto the field, we wisely chose seats on grassy rise a few feet above the crowd, affording us a unique view of the entire field and a clear sightline to the stage where we hoped our next President would soon appear. CNN continued to report election results over the next hour, with the crowd wildly cheering each Obama victory. Just after 10 p.m., CNN announced in rapid succession that Obama had taken the electoral vote in Virginia and California, making him the next President of the United States. Covered in goose bumps, we knew we had made the right choice to attend. We shared the moment intimately with strangers who had travelled from around the country. 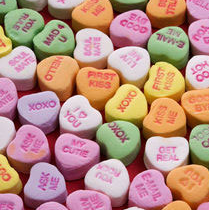 Blue-collar men and women hugged the likes of Oprah Winfrey. Grandparents explained the social significance and shared high fives with their grandchildren. Whites, African Americans, and every group in between shared in tears of joy at the prospect of a new hope for America. We watched John McCain’s concession speech intently on the jumbo-trons. 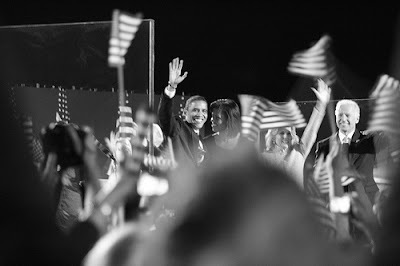 While boos could be heard from the Arizona crowd nary a sour word was uttered by the Obama supporters. Kudos to the Chicago crowd for their respect of McCain. A faceless voice from backstage announced, “Final sound check for the next President of United States,” and the elation started anew. And soon the crowd closely resembled a giant wedding as 75,000 people danced in unison to Stevie Wonder’s Sign, Sealed, Delivered and Sweet Home Chicago. President Elect Obama and his family’s entrance was met with a welcome for the ages, something Jessica compared to what the coming of the second Messiah might resemble. I put my arms around Jess because she was shivering, but learned that she was shaking from nervous excitement rather than cold. Quite a reaction from someone who had never previously voted or cared to pay attention to politics. The crowd grew pin-drop silent as the next leader of the free world began his remarks – the droning of the government helicopters overhead was the only background noise. His choice of “Hello Chicago” instead of “Hello United States” made the moment even more personal. As Obama reached his now iconic “yes we can” portion of his remarks, the crowd echoed him, as if in prayer – perhaps one for a better America where all men really are created equal. The walk home was the exact reverse experience of our trip to the park – the magic of the evening dying into the quiet streets of our nearby neighborhood. By the time we arrived on our block, we were once again alone. As we lay in bed, having just been part of what is destined to be one of the country’s most historic moments, the only reminder of our participation was the sound of the helicopters, still overhead, late, late into the night. Yesterday was the day I planned to cut the grass, hopefully for the last time this year. I started cutting at 5:30, after we ate dinner, and was barely through with our tiny backyard when I noticed that it was getting fairly dark. And as I continued cutting, the darkness grew, and within 45 minutes, all sunlight was gone -- it was dark, and I was almost finished ... but not quite. I ended up finishing the front yard in the dark, with the help of the streetlights and our front porch lights. As I was cutting, I kept thinking of the impending Daylight Savings Time, that I usually cherish. But this year, with the help of M, who has been waking up between 4:15 and 5:00, DST should be extra fun. As you enjoy your extra hour of sleep, think of me, who will be awake between 3:15 and 4:00 a.m. Sunday morning. At first, I tried to patch things up myself. It was the Thursday night that the NFL season began, and I was sitting in the living room watching the Redskins get beat up by the Giants. And in the corner where the ceiling meets the wall above the fireplace, I noticed a shadow that seemed out of place. And then, the shadow slowly began to move, trickle actually, down the wall. Huh? I got up to check it out, and yes, we had water coming in from the outside where it was steadily downpouring. After a few calls to my dad and father-in-law asking for advice, we felt hopeless. We set up a few fans and a dehumidifier and waited. It rained most of the night, but in the morning, the interior damage wasn't that bad. I had to get a ladder in order to get up on the roof, but I did, and saw ......... nothing. There was nothing out of the ordinary, but I knew the lead was somewhere by the fake-chimney that we have for our gas fireplace. I patched all around where the chimney and roof meet with caulk, and hoped that would seal the deal. But, a few weeks later, during the remnants of Hurricane Ike, we got soaked. So we called in professionals, and today, they took down the fake chimney and are patching up our roof. But, of course, it is now raining. So the job is postponed, but at least we are now dry.